The Adventures of Tomato & Pea — Blog Tour Review and GIVEAWAY! It is so exciting when a writing colleague is published for the first time. It is even more exciting when that colleague is eleven years old! I first became aware of Erik, the Kid Who Reviews Books, when we both participated in Picture Book Ideas Month in 2011 (that link leads to a guest post Erik did for PiBoIdMo), then joined Julie Hedlund’s fledgling group 12×12 in January 2012. Eric was nine back then, blogging book reviews, and working on his writing even then. I interviewed Erik and his sister on my blog, and was impressed with the ways they each express their creativity. 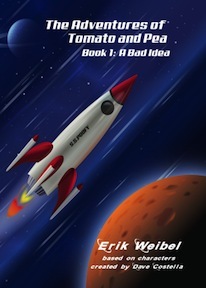 Now Erik is launching his first chapter book, The Adventures of Tomato and Pea, Book One: A Bad Idea, and I am delighted to be a part of the blog tour. I think it says a great deal about Erik that when he put out a call for people to participate in his blog tour, he got so many responses that the tour is stretched over two weeks, some days with more than one post! I’m also delighted to be able to give away one paperback copy of book one of The Adventures of Tomato and Pea to a lucky commenter. Anyone who comments on this post between now and noon eastern time on Thursday, September 19th, will be entered into a draw. I’ll announce the winner on Friday, September 20th. Now, on to my review! Don’t let the names Tomato and Pea fool you – these are not garden vegetables. These are aliens from the planet Oarg, whose only resemblance to their namesakes is their color. Pea is a rookie on the O.L.E. (Oarg Law Enforcement), Tomato is more experienced. And they have a problem. Life is not easy on the planet Oarg. Not only are there invaders trying to take over, there is trouble within as well. Wintergreen, who is Tomato’s arch-rival, and who has nefarious plans for Oarg, has a trick or two or five up his sleeve. Wintergreen’s first plan is to entice Tomato, Pea and their closest friends and allies on board a space cruise, which they do not realize is intended to get them out of the way for good. The plan takes a serious twist when Wintergreen and his cohorts get trapped on the same cruise – they’re all headed for sure destruction unless they can figure out a way to work together. And yet, when they finally get the cruise ship under some semblance of control, they land on a very strange planet. EAR-TH. It will take some clever thinking and a lot of cooperation between them all to get them back to Oarg. Will they make it? The only way to find out is to read the book! Why I like this book: It has adventure, it has wordplay, it has humor, and it has plot twist after plot twist. Erik is very good at making the reader relax, thinking everything is going to be all right, then at the next page turn, throwing an even greater obstacle in the way of the characters. I just had to keep reading, to find out what could possibly happen next, and to see if there was hope for Tomato, Pea, and all the others. Yes, it’s written by an eleven-year-old, but don’t let that stop you — it’s just the kind of book that will appeal to kids, and will be read over and over again. The fact that this book is marked Book ONE tells me that these characters have more adventures ahead of them. I, for one, am looking forward to reading the further adventures of Tomato and Pea! About Erik: Erik is an eleven-year-old sixth grader that loves to read. He started his blog, This Kid Reviews Books when he was nine. Erik writes a monthly book review column for a local free newspaper. He has a black belt in TaeKwon-Do and in his spare time enjoys building things out of LEGOs. He hopes to be an inventor and a published author when he grows up. Erik’s blog: This link will take you to This Kid Reviews Books — it’s a great resource for anyone wanting a kid’s perspective on a plethora of picture books and middle grade novels. Don’t forget the GIVEAWAY! Comment on this post before noon on Thursday, September 19 to be entered in the draw for a paperback copy of The Adventures of Tomato and Pea: Book 1: A Bad Idea. Note: I received an advance copy of this book free of charge in exchange for an honest review. Blog Tour Announcement for The Kid Who Reviews Books! International Dot Day — Make your Mark! Great review, Beth! I am constantly impressed by Erik. This is a book a lot of adults would be proud to say they wrote! I haven’t had a chance to read the whole thing yet, but I do have a copy, so please don’t count me in the giveaway lest I should happen to win and take the book away from someone who doesn’t have it yet! Thanks, Susanna — I heartily agree with you about Erik and his book! I know you’ll enjoy the rest of the book. Thanks Ms. Stilborn! You’re a STAR! 😉 (you really are) I’m glad you liked Book 1! I’m working on Book 2 right now! 😀 I am glad you like the twists in the book. I think it is fun to write them. Thank you for hosting a giveaway! I really enjoyed your review and I’m also thrilled to see Erik putting his wonderful talents to great use getting his story out. Go Tomato and Pea! Thanks, Angela! I’m with you in your cheering for Erik, Tomato and Pea! This is just GREAT! As I have told Erik I am SO PROUD of him! The reviews on Amazon and the one you did here are so helpful I just bought TWO copies. One for me and one for my grandson. He is the perfect age of ten for this book. I am so proud of Erik, too. YAY that you’ve bought the book! Cross your fingers for the draw! Great review Miss Beth! We need more Eriks!! Thanks, Julie! You are right!!!! Hurray for Erik! He has the dedication and the TALENT! to make it as a writer. He’s an inspiration to kids and adults. You are so right, Deborah! Thanks! Way to go Eric – – and good luck!!!!!!!!!!!!!!!!!!!!!! Excellent review of Erik’s book, Beth. I love how everyone has a different take on the book, but there is also consistency — they like his word play, humor, edginess and a great plot! I hope we will have the opportunity to follow him over the next 10 years, to see where his path is leading him. Thanks, Pat. This blog tour is great! And yes, it’s going to be interesting to see what Erik does in the future. Stopping along Erik’s blog tour, Beth. Another fabulous review for Erik’s book, which we also enjoyed very much. Yippee! Nice to *meet* you and we will be following on twitter and more. Have a happy weekend. Thanks so much, Christine! Good to “meet” you, as well. I must check out Stanley and Katrina now! Erik is awesome. I like him so much, I want to lick his face and chew his book to shreds. LOL, Cupcake! Better let Mom read the book first! Thanks, Joanna. And good luck with the draw! At Erik’s age, I was just dreaming about being an author, not actually making my dream come true. Way to go, Erik! I’ll be rooting for you. At Erik’s age, being an author hadn’t even occurred to me! I am so impressed with him, and so proud of him. Erik is incredibly impressive with all his talents and skills! And you do wonderful reviews, Beth! Best of luck to Erik on this and future books. With his drive and abilities, he will go far! Thanks so much, Teresa, and I totally agree about Erik — he’s going far in this world, I am sure! I am so proud of our Erik! I’m not sure if he knows it, but I think we’ve all adopted him as our son. I am so impressed by his willingness and eagerness to learn about picture books and he is not ashamed to be around us grown-ups! I am very proud of him, too (although at my age, I’m more like a granny!) Thanks, Romelle! My kids are hoping to read Erik’s book. I, too, am impressed w/Erik and his setting up a blog tour! Thanks, Tina — good luck in the draw! Great review. I think we are ALL very proud of Erik! It’s so lovely to have him among us. And what talent! Thanks, Diane! You’re so right about Erik! I have been a fan of Mr. Weibel for a long time. He has a wonderful way with words. Your review was perfect. I would love to win a copy of his book. Thanks, Darlene — he is a great kid, and has a great future ahead of him, which I hope will include writing many more books! You and This Kid Reviews Books have both been pinned. Well done. Super review, Beth. I’m playing catchup on the blog tour, but I’m so thrilled with the response Erik has gotten from bloggers and readers. Thanks for helping to make it happen!